It has been known for centuries that natural citrus oils, taken from fresh citrus fruit, have many unique and wonderful properties. And for years the makers of Citrus Magic have been developing and fine tuning unique citrus-based products to take advantage of the natural properties of citrus fruits. For example, when sprayed in the air, citrus oils that have been properly refined and blended destroy odours naturally, while leaving behind the very fresh, clean fragrance of fresh-cut citrus fruit. In addition to their odour control properties, citrus oils are excellent cleaners that now replace many harsh, petroleum-based chemicals in a wide range of cleaning products. Citrus oils not only help in cleaning but they can also impart highlights and shine to human hair and can help brighten natural fabrics like silk, wool and cotton. Lemon oil has for ages been used as an excellent treatment for natural wood. Citrus oils are natural insect repellents. Household cleaners hold hidden dangers for your children. So what is the safe way to clean your home? A new study has found that children exposed to gases emitted by household cleaning products and furnishings are four times more likely to suffer from asthma. Most cleaning products, carpets and paints contain abrasive, toxic and irritating chemicals – but what are the safer alternatives? These contain an array of chemicals such as petroleum based perfumes and chlorobenzenes, which are irritating to the eyes, throat and lungs. Allergic reactions to air freshener may range from sneezing and watery eyes to asthma attacks. Houseplants such as English Ivy, spider plants and peace lilies can help remove unpleasant odours. Unlike most air fresheners, which cover up one smell with a stronger one, products such as Citrus Magic Air Freshener contain natural citrus acids which dissolve airborne odour emitted by smoke, mildew and pets. Citrus Magic’s range of natural, citrus based products are environmentally friendly and do not contain harmful chemicals. Because they’re part of the family…. Now you can love living with your best friend again. Our natural pet products collection is designed to care for your pet, and to eliminate odour problems caused by pets in every room of the home. Our Family of Quality Citrus-Based Products are Ideal for Use in Hospitals, Clinics, Physician Offices, Nursing Homes and Home Care Settings. Buy 6 Odour Eliminating Air Fresheners and only pay for 5!! 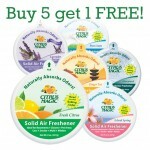 Buy 6 Odour Eliminating Solid Air Fresheners and only pay for 5!! Buy 3 Pet Odour Eliminators and get 1 Pet Shampoo free of charge!